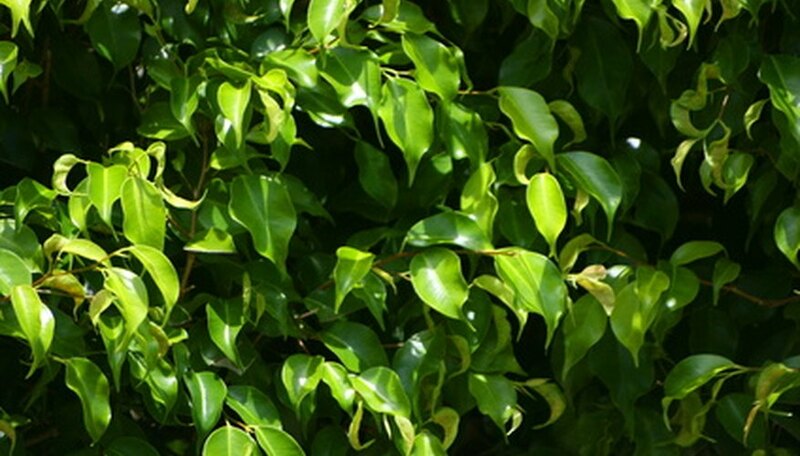 Ficus trees are grown for their beautiful foliage and are common houseplants. The species includes the Fiddleleaf Fig (F. lyrata), the Rubber Tree (F. elastica) and the Weeping Fig (Ficus benjamina). Ficus trees are easy to care for. Avoid wetting the leaves or overwatering the plants to help prevent diseases. Regular fertilization, good air circulation and adequate light are important to the health of ficus trees. Ficus trees that are set outside during warm humid weather may develop fungal leaf spots, but they rarely occur inside. Leaf spots normally are not harmful, although they affect the appearance of infected trees. Treat leaf spots with a fungicide approved for ficus trees at the rate recommended by the manufacturer. Anthracnose caused by Colletotrichum or Glomerella fungi cause yellow spots that darken to brown and develop masses of yellow spores. Botrytis blight forms large tan or brown spots with concentric rings and masses of fuzzy gray spores. Tiny slightly raised dark green or red spots on the lower surface of the leaves are symptoms of Cercospora leaf spot. Corynespora leaf spots appear on young leaves as reddish spots. Several other fungal diseases affect ficus trees. Twig blight causes small twigs to turn brown and die. Twig cankers caused by fungi are corky lesions that can girdle and kill the affected limbs. Prune and destroy infected plant material to prevent the spread of disease. The fungus Sclerotium rolfsii causes Southern blight. Masses of white cottony mycelium grow on the stems and leaves of infected plants and cause them to die. There is no chemical preventative or treatment for Southern blight. Infected plants should be destroyed. Bacterial diseases are generally fatal to ficus trees. Crown galls on ficus trees are caused by Agrobacterium tumefaciens. Slightly swollen areas on infected leaf veins, stems or roots, grow and become corky. No chemical preventative or control is effective. Affected plants should be destroyed to prevent the spread of infection. Xanthomonas leaf spot begins as tiny water soaked spots on the foliage. The spots enlarge rapidly and may develop bright yellow margins. Bactericides used according to the manufacturer’s directions may prevent Xanthomonas leaf spots. Infected plants should be destroyed.